If you are looking for tutorial on Stored Procedure for Crud operation in PHP with Ajax Jquery then we are going to discuss one more advance topic in web development. In this tutorial we will discuss how can we use store procedure with Ajax and Jquery for Insert Update Delete and fetch data from Mysql table in php script. In this tutorial we will make crud operation in php with ajax. For making crud operation we will use stored procedure for making crud operation in php with Ajax. In this crud operation we have use Ajax with php so all operation will be done without page refresh. Here crud means create, read, update and delete of database table data. Insert, Update, and Delete features is almost use in every website in PHP with Ajax. In this script, we will fetch users data from database and display that user data on web page with update link and delete link. By this type of link we can update and delete data from database. This operation has been done without page refresh event. For this type of operation here we will use stored procedure. First of all what is stored procedure. Stored procedure is a collection of query. It is also called pre compiled sql query. Stored Procedure is mainly used for enterprise level application. If you are working on any large data project then you can use stored procedure for Insert Update Delete of data operation. So here we will stored procedure from crud operation in php with Ajax. 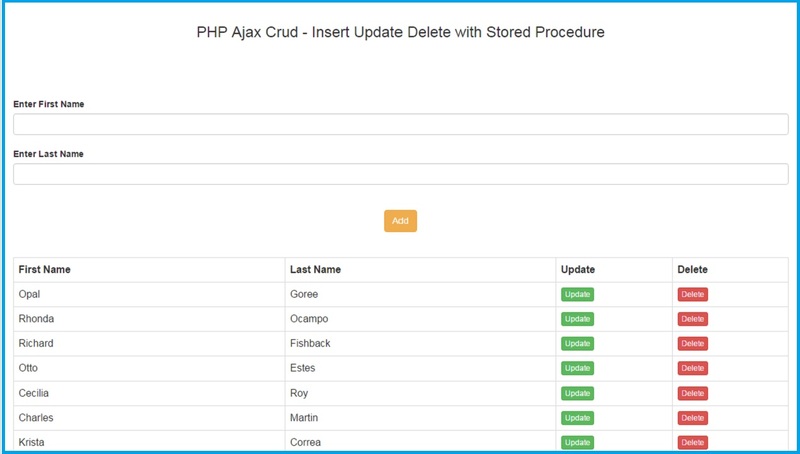 This is our complete system in which we can fetch, insert, edit and delete data from database by using stored procedure in php script with Ajax request. Insert, Fetch, Update and delete records from database by using php is a very simple feature for new programmer. But here is something complex task, In this task first of all we have use stored procedure for crud operation and second is we have use ajax method with stored procedure for crud operation. So it is something new feature, if you have working on very large data application then you can use stored procedure and with Ajax request. You application working speed will be increase than normal php application. This is because stored procedure execute query at database server not on php script. So your application will execute faster than normal php application. Insert Update delete and fetch data is the normal operation in any web application. So if this operation perform fast then your application will run fast. So for execute this basic operation fast, then you can use stored procedure in your application. Mainly stored procedure are stored in your data base and it will execute from database so it will reduce execution load on your php page. So this way we can increase execution speed of any web application by using stored procedure in php script with Ajax method. Hello guys..i have a problem.. i got a table with name 'courses' and the columns are: course_ID, course_name, course_category, course_ECTS, course_room.. I want to ask where i put the course_ID column in the php files.. I have done successfully the insert stored procedure but i failed to do the update and delete stored procedures. please help!! thnx and great job guys!! Great example, all works fine!